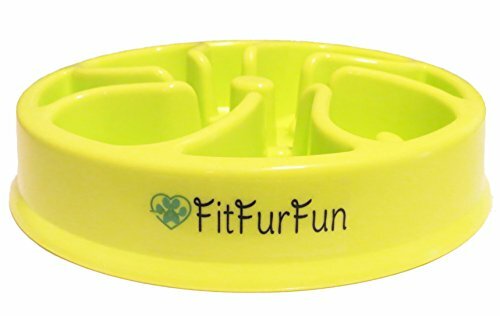 "FitFurFun" slow feeder pet bowl for dogs and cats: This Slow Feed Bowl has unique obstacles that slow down your fast eater and lengthens his or her mealtime! We recommend placing bowls on a non-slip mat or surface to prevent the bowl from sliding around. This bowl works great for pets who have a hard time pacing themselves or are prone to being overweight! It is durable, light-weight and easily portable. Would be easy to throw in a bag for travel or an overnight stay. Comes in 3 bright, cheerful colors: blue, pink, and lime green. Holds about 2 cups of dry dog food or 19 fl. oz. (0.5L) of water. This slow-feed bowl is healthy and fun! It has a fun and interactive design to challenge your pet, and help keep him or her thinking, entertained, and interested, yet not frustrated. May not be suitable for all pets and personalities. Eating from this bowl will help train your pet to have more natural eating habits by slowing down and digesting their food. A slow feeder is Veterinarian recommended and allows for a healthy lifestyle. Slower eating has been proven to help with better digestion and plenty of other benefits. It prevents overeating which can lead to pet obesity. Obesity can attribute to arthritis, cardiovascular disease, diabetes, and decreased life span making it a serious medical condition for your pet. Be sure to also measure your pet's food to ensure they are eating the correct amount in a day. Slow eating also prevents choking, indigestion, regurgitation, bloating, and the lethargy that comes along with it. Keep your cat or dog's tummy happy and prevent messes on the carpet and furniture! This product is completely food-safe for your pet! BPA, PVC, and Phthalate free! Made with high-strength ABS materials. A clean bowl is essential for healthy eating! We also recommend you wash any food-related products before first use. HEALTH & WEIGHTLOSS! - Promotes healthy eating and pet weightloss by slowing the pace of your fast eating pet! SAFE FOR YOUR PET! - Prevents choking, overeating, obesity, indigestion, bloating, lethargy, and regurgitation by reducing the speed of the eating process. FOOD-SAFE! - Holds about 2 cups of dry dog food or 19 fluid ounces of liquid. BPA, PVC, and Phthalate free! Made with high-strength ABS materials. If you have any questions about this product by FitFurFun, contact us by completing and submitting the form below. If you are looking for a specif part number, please include it with your message.